Flash forward to a few weekends ago, when I recalled the game and decided to look it up again. I hadn't realized it was available for the desktop as well (and, as I would later learn, that it was in fact designed for the desktop). While it runs on a number of platforms (including some surprising ones, like ReactOS, BeOS, and OS/2), the Linux installation of OpenTTD is quick and easy. 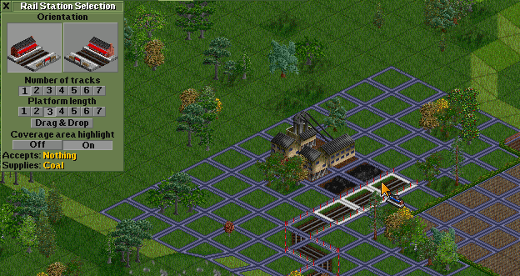 All it took was a $ sudo dnf install openttd -y on my Fedora machine and I had the game up and running. This game has a somewhat steep learning curve. It's maybe not Dwarf Fortress steep, but if you're primarily familiar with casual games, or maybe hack n' slash or first person shooter games where the mechanics are fairly straightforward, you may be in for something a little different than what you're used to. But if you're familiar with other city planning games, like the SimCity series, at least some elements of the game should look familiar. 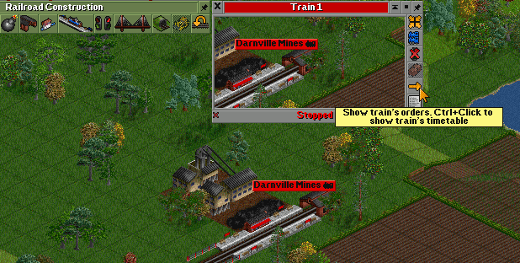 OpenTTD is a clone of the classic Microprose game Transport Tycoon Deluxe (TTD), although it's probably more accurate to say it's both a clone and an expansion, as the game hosts all new features not found in the original. The basic premise of the game is that you build transportation networks and connect different types of resources with appropriate means of production, provide products to towns and cities, and create ways for people living in those towns and cities to move around. You're a transportation industry magnate: You build the means for people and goods to travel, and reap the profits. A couple of hints for newcomers. First, don't just rely on my quick description below to learn the game. 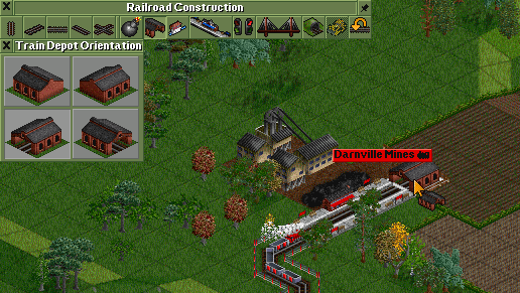 OpenTTD has an excellent wiki documenting how to play; I suggest you read at minimum the tutorial section as you play, though if this is your kind of game, you'll probably read the entire wiki before it's all said and done to understand the precise mechanics of gameplay. Second, as I mentioned, while this game is available for Android, the best gaming experience is definitely on a device with a mouse pointer. And the larger and higher resolution your monitor, the better. This isn't because of especially fancy graphics (in fact, the default graphics are a throwback to another era), but rather, if you're like me, you'll want to have a heck of a lot of dashboards open and running at any given moment so you can keep a close eye on your transportation empire. All right, let's dive in. Start the game, and generate a new world. For getting started, the default settings are fine, although you can see from the outset that you'll be able to customize your gaming experience to match your interests. In the example below, I ended up with a screen showing a town and a few different resources. Hold down the right mouse button and scroll around a bit, and click on a few of the large structures to see what they are. You can also zoom in and out with your mouse wheel. It's probably also a good idea to hover over some of the menu items to see what they do, and click them to open their dialog windows if you're curious. Let's get started by connecting a coal mine to a power station. You can pick any two compatible structures, but coal and power stations are a good way to start generating money when you start out. First, click on the track building icon. You'll probably want to use the Autorail mode, which makes sure the track is facing the right direction if you draw it in a line, segment by segment. Curves in the track are okay, but as you advance, you'll find that too many curves too close together can slow down your trains. Next up, let's place a rail station. Rail stations need to be oriented along the tracks. As you play the game further, you may wish to build bigger stations to accomodate more trains and more cargo, but for now, let's build a station three units long with one set of track. Longer stations can load and unload cargo faster. 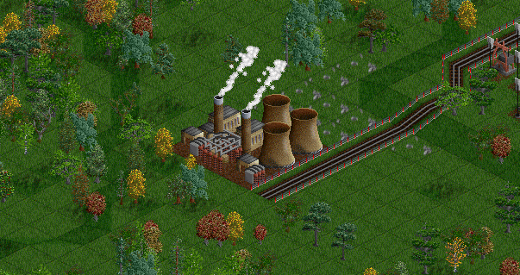 Build one at both ends of your track; one near the coal mine, and another near the power plant. Next, let's add a train. To add a train, first we'll need to add a train depot. For this simple example, add the train depot to the end of your tracks, just past the station. Make sure it's oriented in the right direction so you train can enter the tracks. Depots are important not just for building trains and adding cars, they also provide maintenance to your trains as the wear. Click on the train depot, select New Vehicles, then pick out a locomotive, and and add few coal hopper cars. Now you've got a train, but it doesn't yet know where to go! In the new window that pops up, click the little yellow arrow to set orders for your train. Click Go To, then click the first station on your route, then repeat the process with the second station. Routing can get fairly complex as you make complex tracks and interacting trains which will require signals to avoid collisions, but this train between two stations should chug along just fine. Finally, click the bar at the bottom of the train's window to get your train moving along its assigned route, and watch the money roll in! This is just the beginning. Now that you've connected two structures, see if you can connect two different types on your own. Then see if you can find a chain that requires multiple connections, like factories which require livestock, grain, and steel. The steel will in turn require iron ore. Or try out some of the other transportation types, like buses, trucks, planes, and ships. All of this only begins to scratch the surface. OpenTTD has a vibrant and active community behind it, and there are numerous add-ons available to players who want to expand their experience: everything from new graphic resources to playable scenarios to AIs to maps and much more, even completely new game logic. Custom files are generally available under the GPL or Creative Commons, depending on the type of asset. The game also features multiplayer capabilities, and although I haven't had the chance to try them out yet, they look like a lot of fun. Considering I've been playing a few save games for several hours now, I can only imagine that multiplayer games are, well, epic. It's not a game for everyone, but it is just one more reminder that if you thought Linux couldn't be a fun gaming platform, and that open source games weren't worth your time, it's time for you to think again. All screenshots in this article are by the author and licensed under Creative Commons. Jason, I really like simulation games. I still keep a VM with Red Hat 5 (not RHEL 5!) so I can run the Linux version of Railroad Tycoon. Nice story and I am installing openTTD as I type. Let me know how it goes! I'm still figuring out new things every time I play.